I am running a bit behind with my show reports because the past three weeks has been filled with bottle activities. 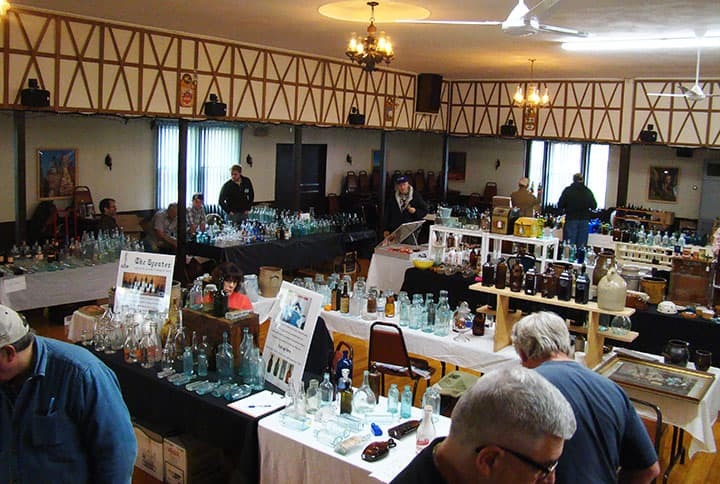 I have been to the Rochester bottle show, the Mohawk Valley Bottle Clubs show and just returned from the Mansfield show. I set up at all three shows and also went to Norm Hecklers barn sale in between. So, I am playing catch up at this point! 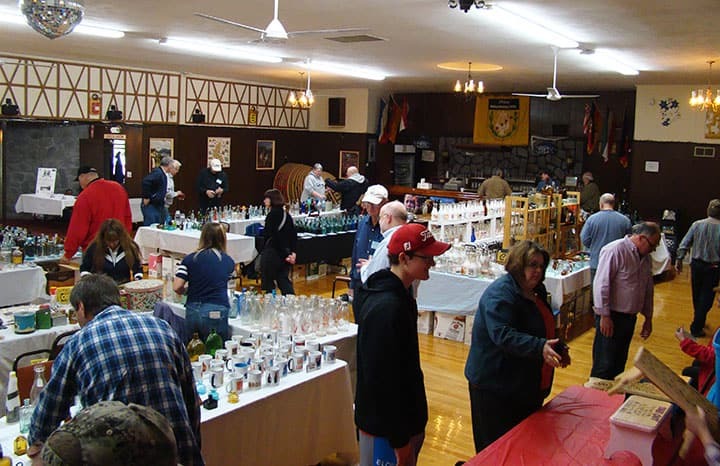 The Mohawk Valley Bottle Club held its 23rd annual show on May 7th. 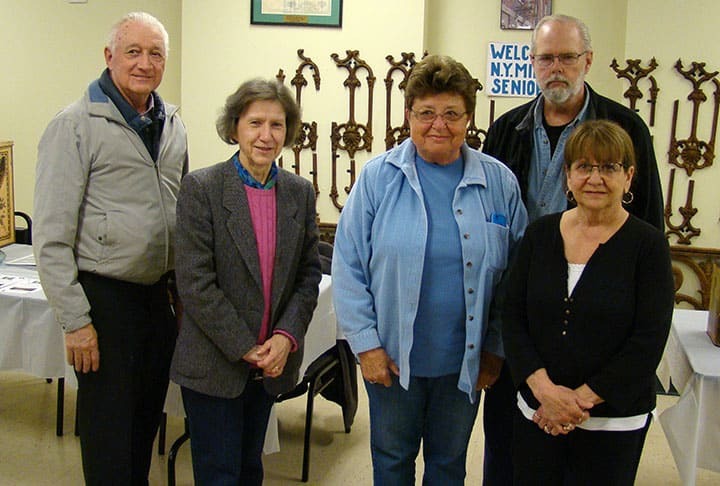 The location once again was at the Utica Maennerchor located at 5535 Flanagan Road in Marcy, New York. The weather was rainy but this is not necessarily a bad thing for shows held this time of year as most people tend to do outdoor activities in the Spring when the weather is nice. 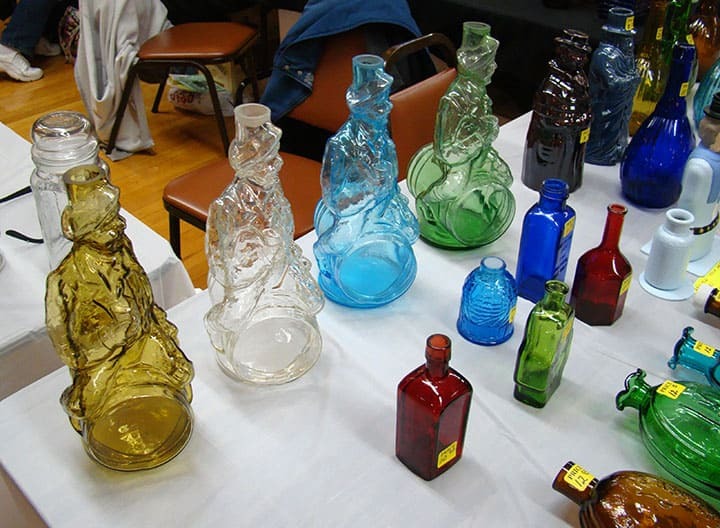 The show was 50 tables with 26 different dealers mostly from the Central New York area. They had over 100 people through the door and the show room was busy all day. I saw a few new faces set up which I had never seen before at any of the regional shows. This is a good thing for the hobby. I always try to buy from the new dealers to keep them feeling good about setting up. The Mohawk Club is a great bunch of people who try to have fun all the time. They understand the hobby and what it really is about; enjoyment and friends. So many times, we get caught up in what’s the best or biggest. From what I can see, this pulls us away from what made the hobby greatest, the people. Club President Jon Landers was just elected to the FOHBC Honor Roll. This is an honor that Jon earned for sure. I have known Jon for many years and he promotes the hobby as well as anyone you will ever meet. 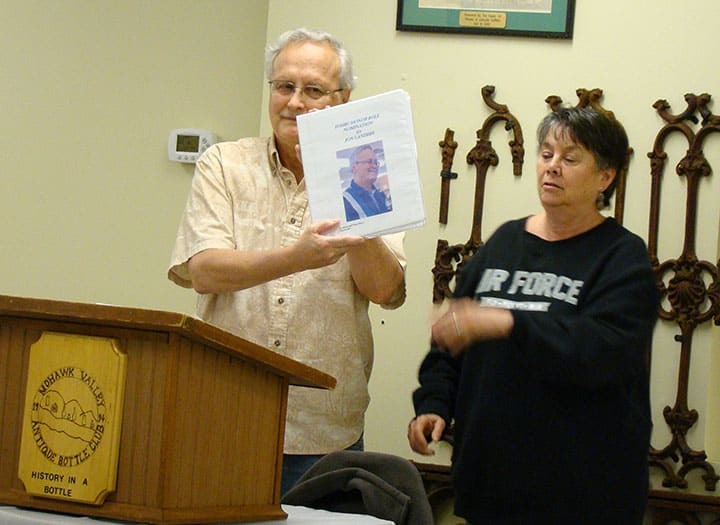 Being on the FOHBC board, I read the Honor Roll application and submission booklet Jim and Val Berry (also FOHBC board and Mohawk Valley club members) submitted for Jon. It hit the nail right on the head and was the best Honor Roll application that I have seen in my many years with the FOHBC. I look forward to seeing Jon get his award at the Springfield National banquet. 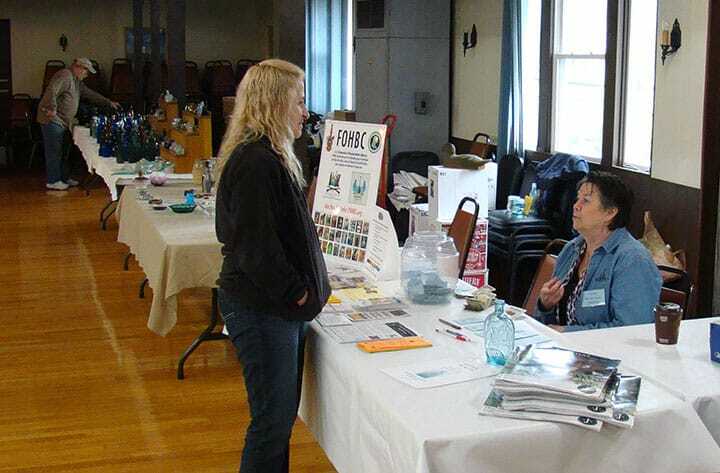 The local Channel 2 news crew was on hand at the show asking people about the show and hobby. I had a chance to speak about the upcoming Springfield National convention. I am told the news segment looked good. I have not seen it myself. As always, I am including photos of the show. 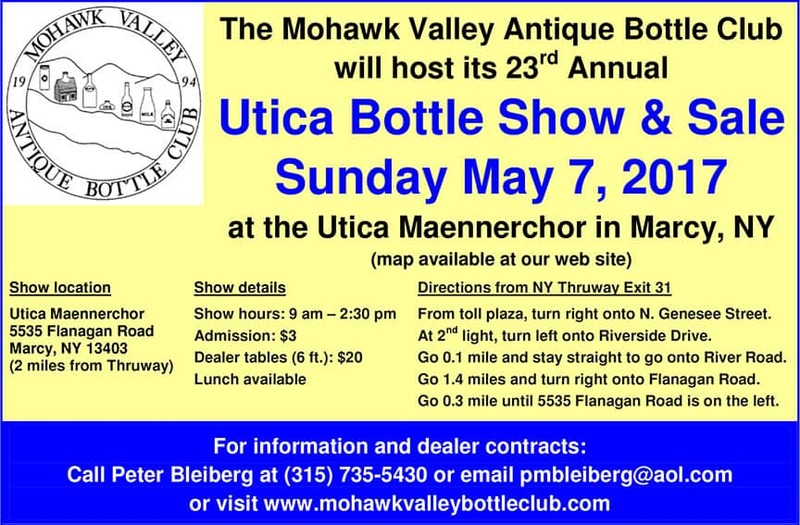 Next year mark your calendar and join us all at the Mohawk Valley Bottle Collectors Show and Sale. Overview photograph of the show. A second overall photo of the other side of the show room. 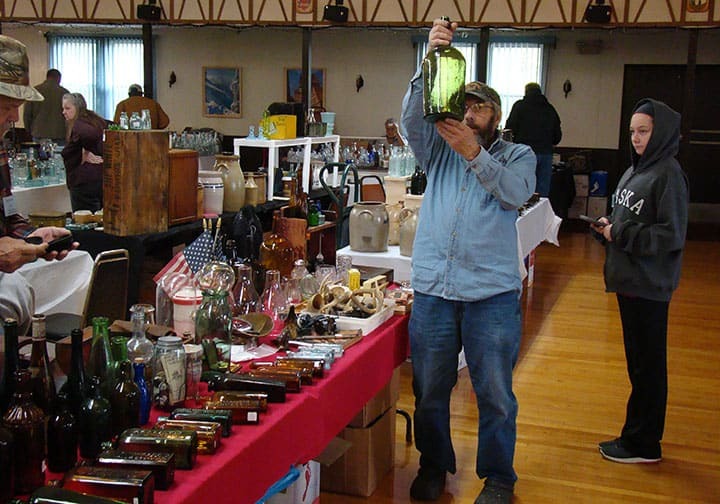 Jim Berry checking out a great green bottle. Val Berry staffs the front desk waiting for the doors to open as Linda Sheppard visits with her. Watch for them both to team up at the front registration tables in Springfield. 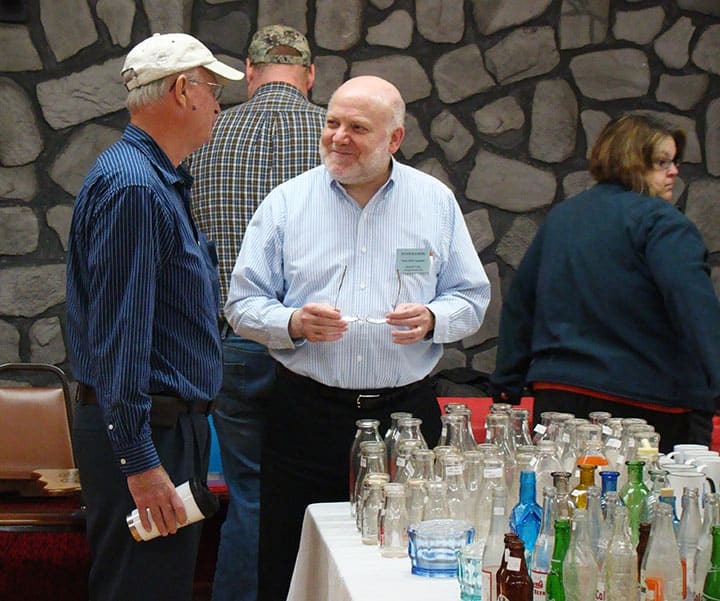 Peter Bleiberg visits with a fellow milk bottle collector. Watch for Peter at the Springfield National. 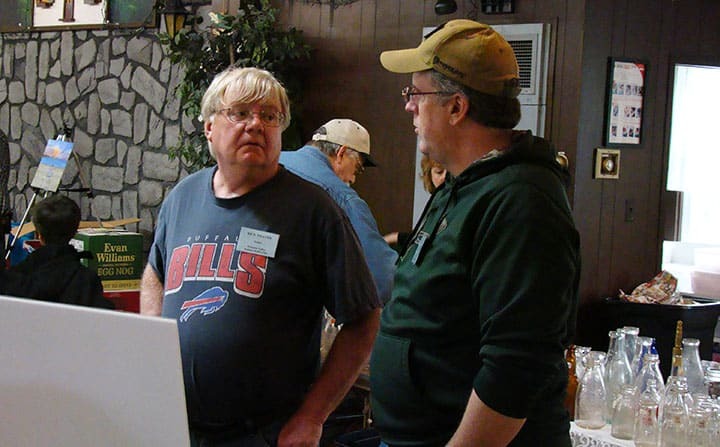 Jeff Ullman (right) and Rick Weaver talk about Jeff’s attempt to revive the Saratoga Collectors Club. Rick had a great mineral water collection and Jeff is assembling one now. I am told Jeff got about half a dozen people signed up. I now belong to the Saratoga Collectors Club and support Jeff’s efforts. One of two signs on Jeff’s table. Sue Landers had some nice inks for sale. I spotted the Mohawk Clubs photographer Polly taking photos, so this time it was her turn. 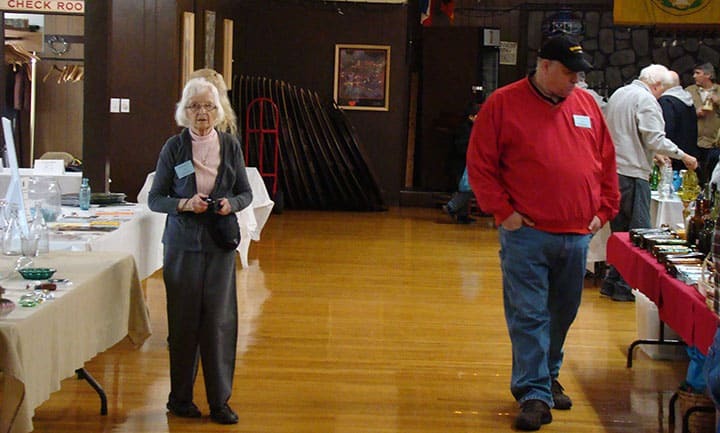 The fellow to the right is Keon Kellogg from the Empire State Bottle Collectors Association. As always, if I am there and so are my FOHBC signs. It took me years to find all four colors of these great Man on the barrel bottles. Here’s a set ready for the picken’. 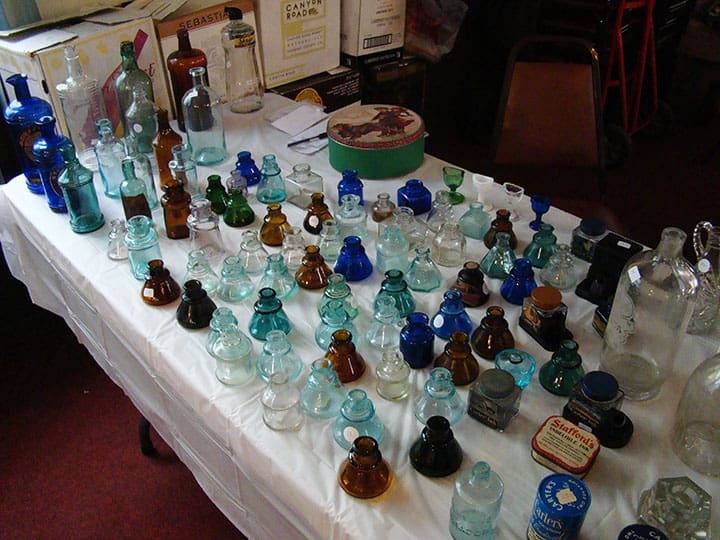 Rodger Thomas had a ton of great milk bottles for sale. 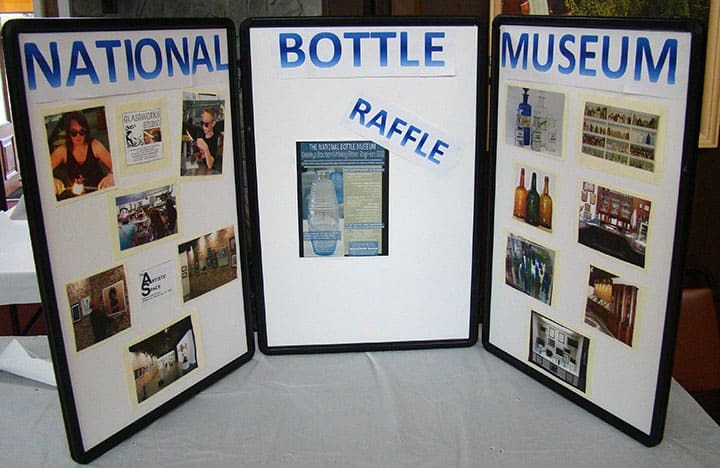 The National Bottle Museum was on hand to promote their great bottle raffle. 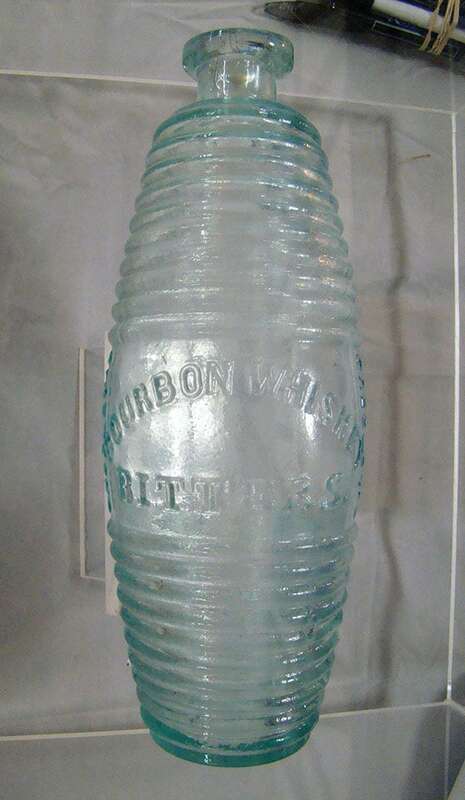 A fantastic aqua vertical Greeley’s Bourbon Whiskey Bitters figural barrel. The Greeley’s Bourbon Whiskey Bitters being raffled off by the museum to raise money for the museum. 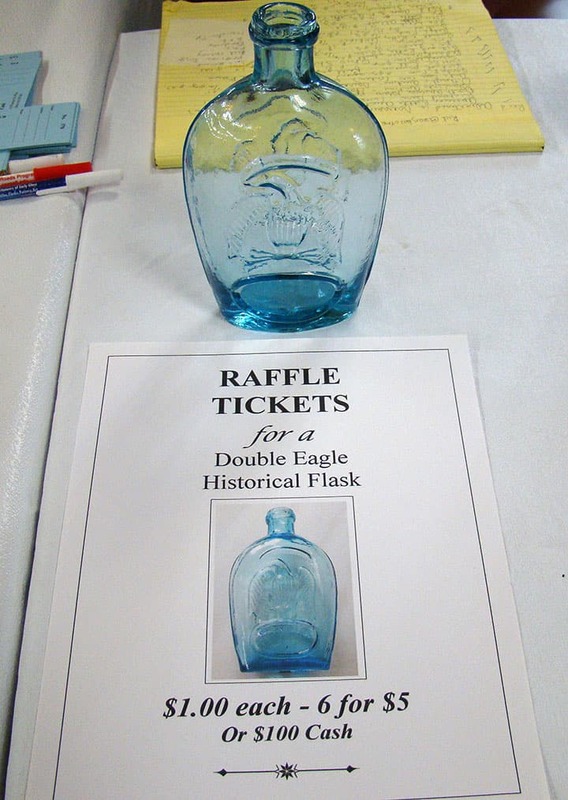 Every year the club raffles off a nice bottle. Not only is Roy Topka a great digger but he is a huge supporter of the National Bottle Museum. Roy was selling raffle tickets for the great barrel bitters. 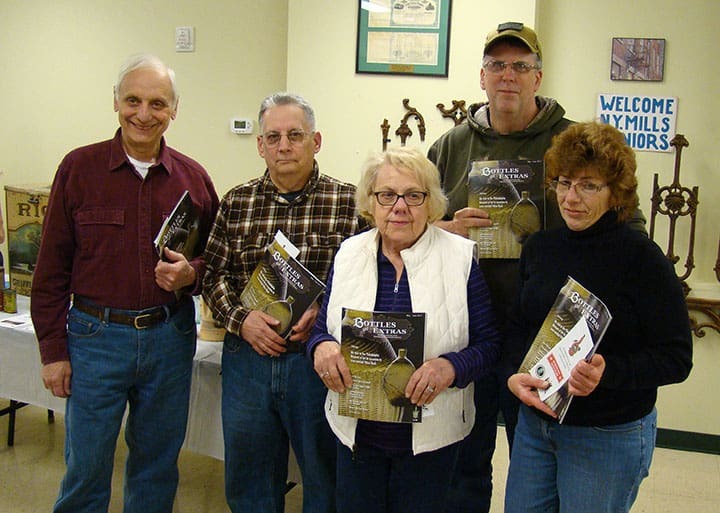 On Monday night at their monthly meeting, the Mohawk Valley Bottle Club decided once again to have a free drawing to members at the meeting for five free memberships to the FOHBC and five free memberships to the National Milk Bottle Collectors Association. They did this last year and decided to do it again this year. I was there to hand out the latest issue of Bottles and Extras to the winners and Peter Bleiberg was on hand as the Milk Route editor to sign people up for that club. So, in effect, they took the money they made at the show and gave it back to the hobby. 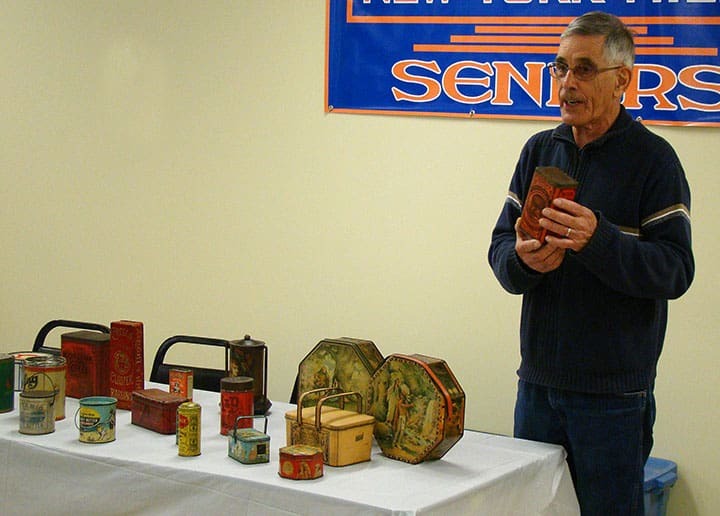 Just before a great Show and Tell program on antique tins by Dave McFadden they drew the names. How great is that! That folks is why I love this club so much. As I look forward to Springfield and the 2017 National Convention and Expo, I realize just how many people from the Mohawk Club are involved. 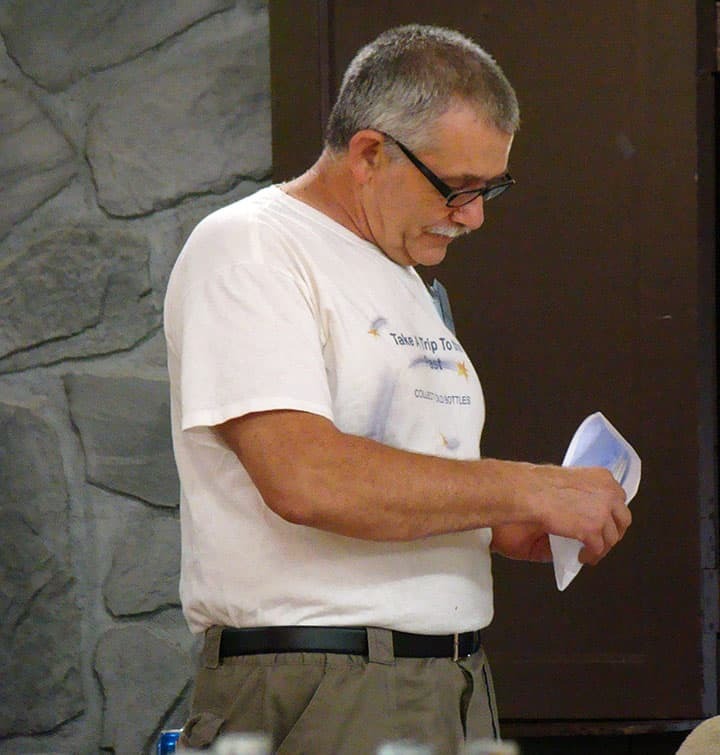 I am a co-chairman, Peter Bleiberg will be doing a seminar, Jim and Val Berry are handling the souvenir program, Jeff Ullman will be helping with security, of course Linda Sheppard will be at the front desk and Jon Landers will be going into the Honor Roll. What a great group of folks. I have included the photos of the winners and thank you guys for supporting the hobby we all love. There were almost 50 people at the meeting on May 8th, now that is support. 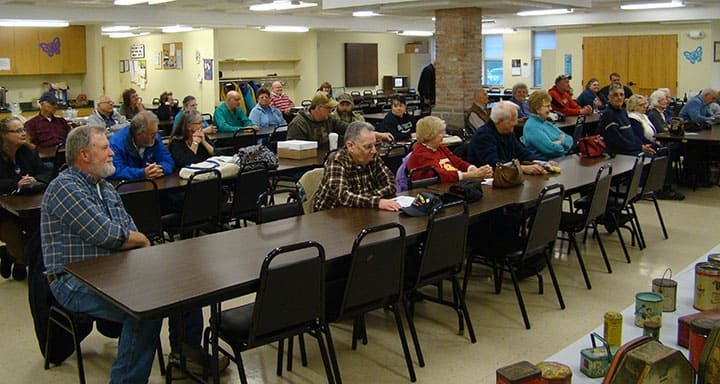 Almost 50 members in all made the club meeting. 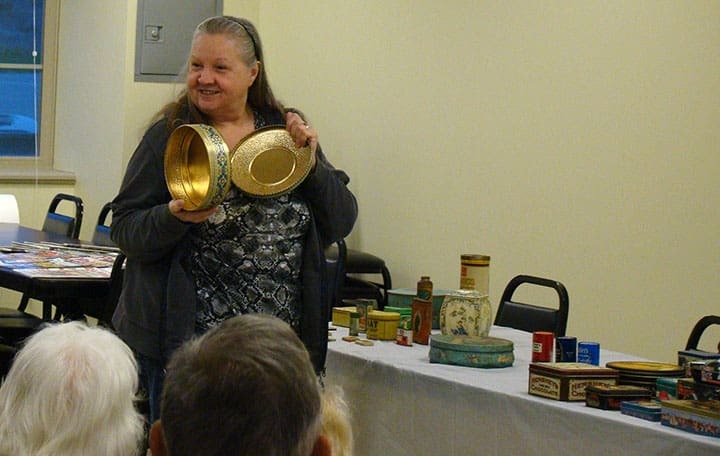 Sue Landers shares her tins with the club during show and tell. 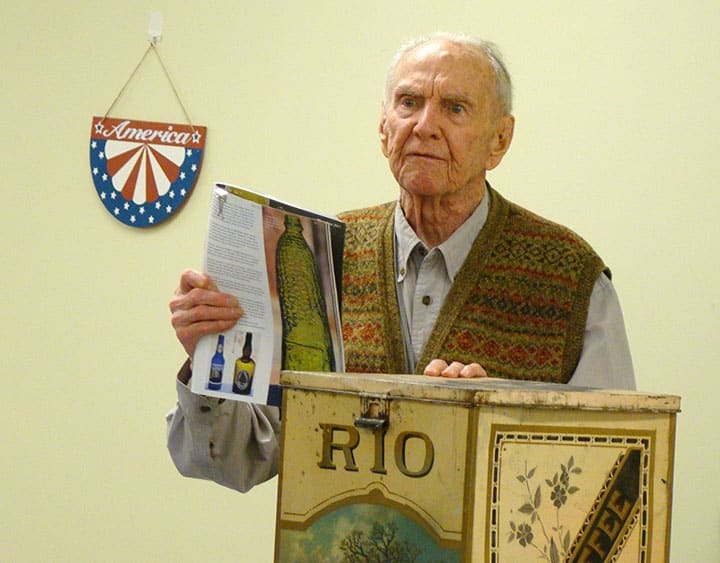 Bob Dicker, at over 90 years old, shares a story about a bottle that he recently saw in Bottles and Extras. Bob shows his bottle just like the one in the magazine. See it does not have to be worth a million dollars to be interesting. Bob’s bottle next to the photo. 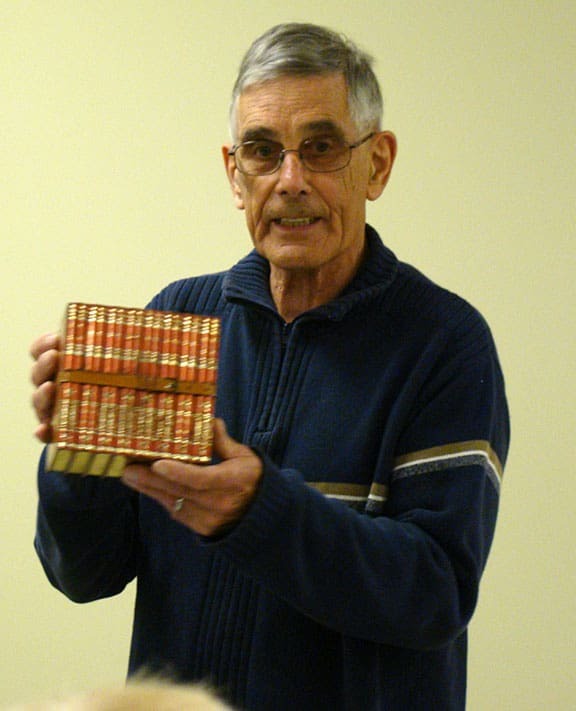 He was very proud to share the story and were glad he did. Thanks Bob. Jon Landers proudly holds up the book Val Berry gave him for being voted into the FOHBC Honor Roll. 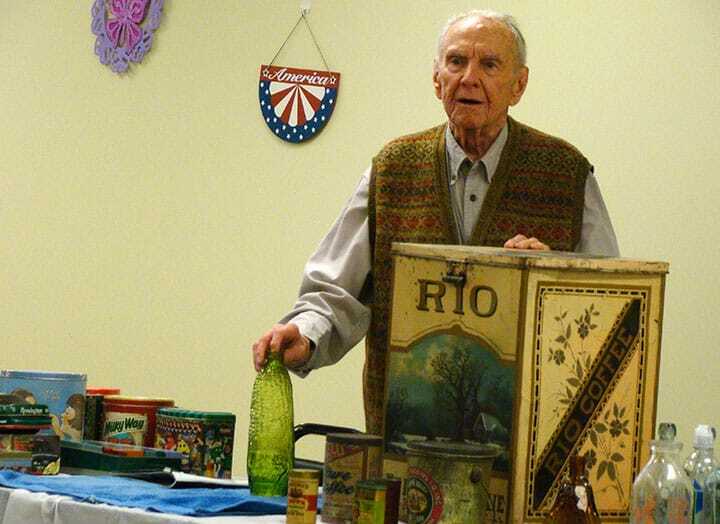 Dave McFadden brought a small part of his tin collection to share with the club. 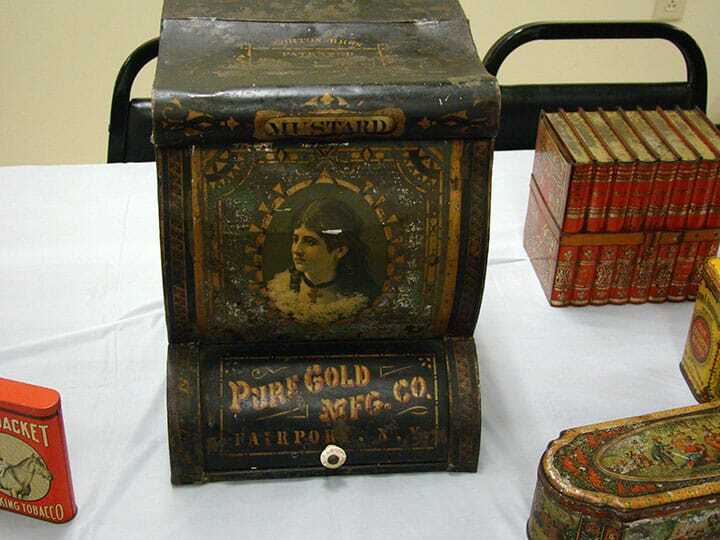 This very early store tin was a club favorite. 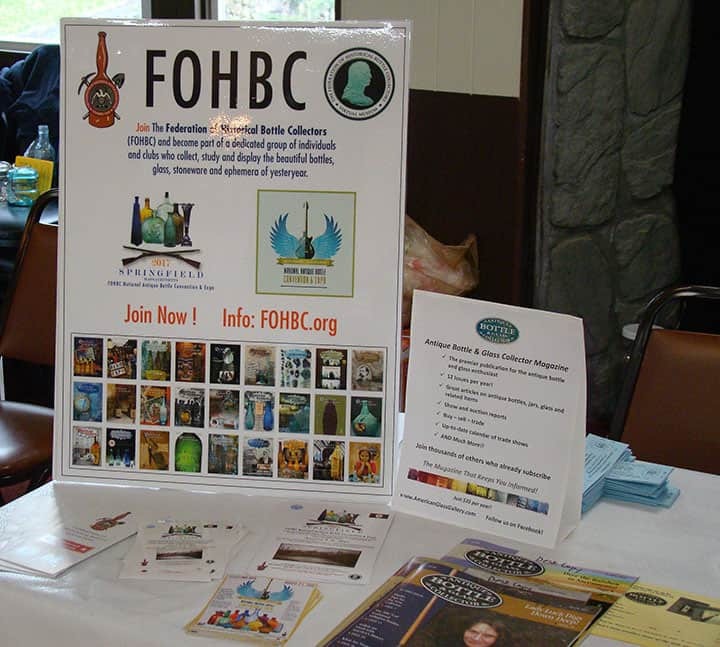 The winners of the FOHBC memberships were Al Casatelli, Tom Andriach, Theresa McFadden, Jeff Ullman and Carol Blenis. 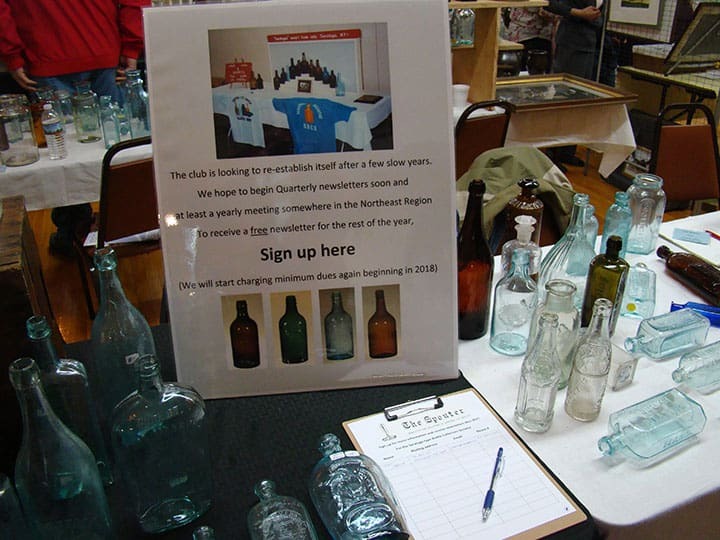 The winners of the Milk Bottle Collectors Association membership were Dan Weeden, Juliann Scatko, Artis Finn, Michael Palczewski and Yvonne Wall. 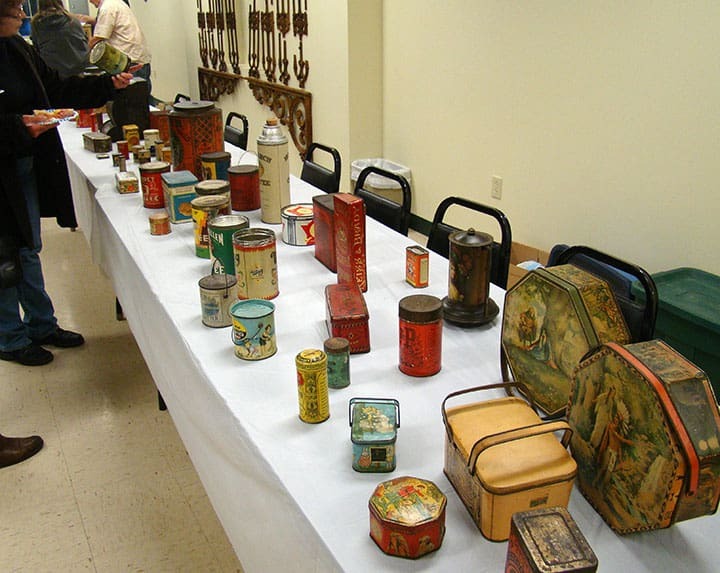 Dave starts his talk on antique tins. It was very interesting for sure. I found this to be an interesting tin for sure. It looks like a set of books on a shelf. 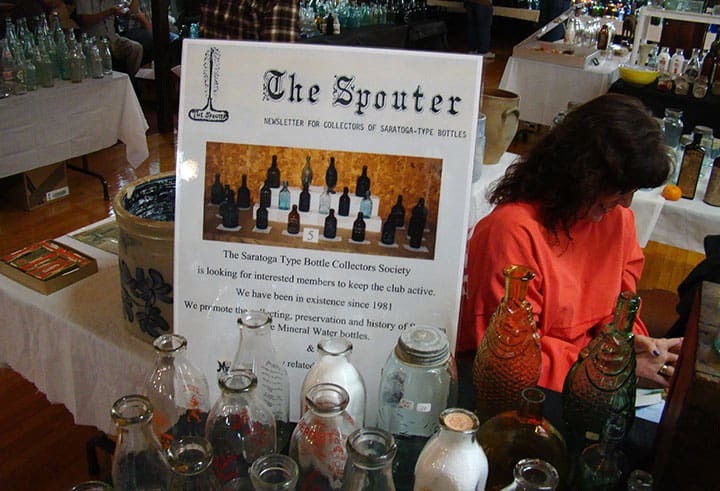 So pleased for Jon Landers, the kind of man and collector all antique bottle clubs would be proud to have as a member. Folks like him is what helps make the FOHBC strong. Wow! 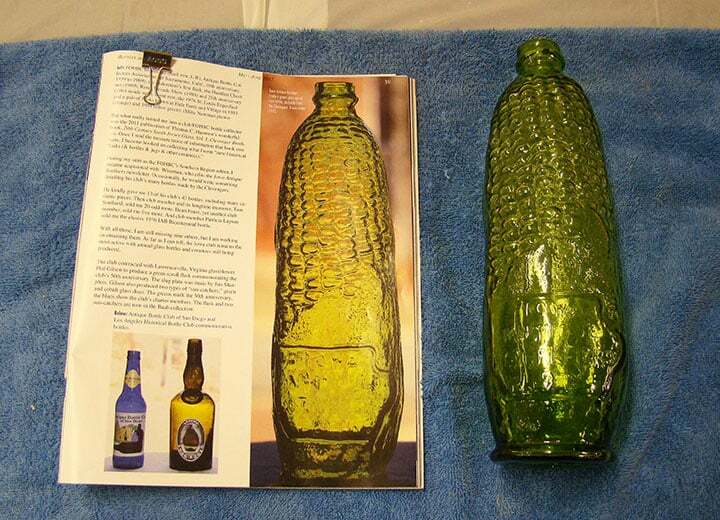 Another ear of corn bottle! Did it have the Iowa Antique Bottleers name on the side near the base? Did the owner have any information on who made it?